I went home for the weekend after a long time and the first thing I did was take my niece and nephew to the cinema. They had been very hyped for this movie while I had barely known much about it. I didn’t expect much from it and man was I wrong. Without further a due let us begin. An alien race called the Boov decide to make earth their home while trying to run from another alien race which seems to hunting them down. They arrive on earth, relocate us to Australia and take residence in our homes. During all this time they think they are actually helping us because we are dumb and can’t take care of ourselves. About 3/4 of the film is spent with the main characters traveling across the world to undo a mistake that could inevitably end all life as we know it. The movie plays around with themes such as fitting in to a group, friendship, family and companionship. Jim Parsons aka Sheldon voices Oh. A cute small color changing Boov who doesn’t fit in with his own race. He is joined by Tip voiced by Rihanna. Tip is a brave wide eyed adventurous girl who is search for her mother. The character development was done well enough that I actually really really cared for the characters. There is a scene which had me literally fighting my tears. It was at that point I looked to my niece and nephew ages 11 and 4 and noticed I wasn’t the only one being hit by emotion. My nephew was literally crying which I never thought he would. He likes to act like a tough guy you see. I had to hold him and tell him everything was alright as it really hit him hard. That made it even harder for me not to cry. After that I had gained a new respect for the film. It was then I knew that the movie had done a great job at making its audience care. The movie is accompanied by various Rihanna songs and some pretty great musical scores. There were scenes that had nothing but music playing which I thought showed how confident the makers of the film were in their sound track. Visually Home looks really great. The Boov wiggle and giggle when they move around. One big thing was that the Boov show their emotion through the color they change to. Green for lying, red for anger etc. The scale of the locations was actually a little breath taking at some points. The effects popped and everything was detailed really well. The voice acting is pretty good all round with Jim Parsons sounding the best. As a warning the corny and cuteness levels in this movie are very high. Some of their lines are a little cringey but they somewhat help these characters grow on you. All in all Home looked and sounded great. I was skeptical about this movie because I thought it was just another cog in the wheel of family movies, I was wrong. 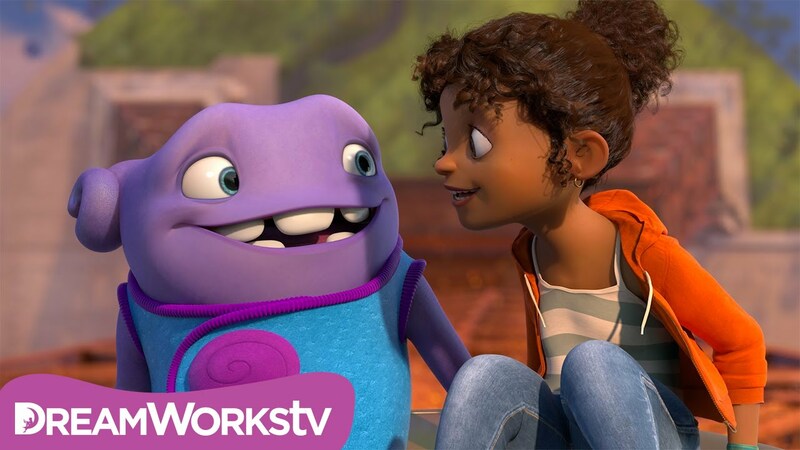 Home is a great film with great characters and some funny jokes too. I would recommend watching this by yourself or with your family.